If you are a citizen of Barbados, you may apply for a passport from the Immigration Department in Barbados, or at one of Barbados' diplomatic and consular missions abroad. If you are more than 16 years of age, you should complete an 'Application for a Barbados Passport' Form A in your own hand-writing. Use Block Letters for all names except your signature. 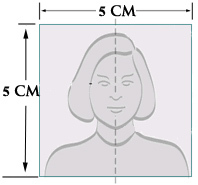 The application form should be accompanied by two (2) photographs. The photographs should not be more than five (5) centimetres by five (5) centimetres and should be taken by a professional photographer. The fees for Passports are as follows. The fees for passports issued by our diplomatic missions overseas vary from mission to mission. You should therefore check with the respective mission regarding the fee schedule. All applicants should submit their original birth certificate or proof of citizenship along with their application. If you do not have an original birth certificate, you may apply for one at the Registration Office, Supreme Court Complex, Whitepark Road,St. Michael, Barbados. Parents or guardians must submit the application on behalf of children 16 years or under, accompanied by the minor. NB: Birth Certificates must bear a seal from the Registration Department, along with the applicant’s name. Minors must accompany parents for passport applications.